The McWane Science Center Collection is made up of nearly a half-million specimens and artifacts related to the natural history of Alabama. This includes Native American artifacts, rocks and minerals, preserved biological specimens, and hundreds of thousands of fossils! From dinosaurs to giant ground sloths to projectile points, McWane Science Center is dedicated to the preservation and study of Alabama’s natural wonders. The history of the McWane Collection begins with the 1970 opening of the Red Mountain Museum, formerly located on the south side of Birmingham. Employees of this City-owned museum spent nearly two decades leading expeditions across the state, collecting tens of thousands of fossils and geological samples. In 1994, the City of Birmingham merged the Red Mountain Museum and nearby children’s museum, Discovery Place, with the private entity, Discovery 2000, Inc. Opened in 1998, this new downtown museum was later named McWane Science Center and now serves as the official repository for the Red Mountain Museum collections. Through continued collecting efforts, the McWane Collection currently stands as the second largest natural history collection in the state. Explore Lab – Watch scientists working on specimens and artifacts from the McWane Collection. Daily activities in the Explore Lab include the cleaning, repair, identification, and labeling of specimens and objects. 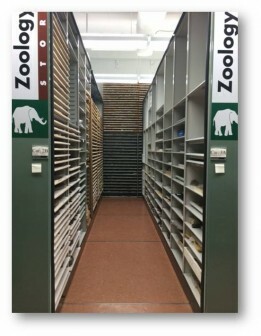 Collections Storage Room – Peek inside McWane’s collection repository. Kept in a secured climate controlled room, see first-hand the giant rolling storage system that serves as the home for the McWane Collection. 1/12/18 Paleo Profile: The Bryant’s Shark. 1/11/18 New Ancient Shark Species Discovered in Alabama. 1/11/18 83 million-year-old Bryant sharks swam in ancient Alabama seas, gave birth to monstrous Megalodon sharks. 1/11/18 Nenek Moyang Hiu Terbesar Ternyata Berukuran Kecil, Lo!. 1/11/18 Arqueólogos descubren nueva especie de tiburón prehistórico. 1/11/18 Siapa Sangka, Nenek Moyang Hiu Terbesar Ternyata Punya Gigi Mungil. 1/10/18 83 million-year-old shark that lived during dinosaur age likely the ancestor of largest ever shark. 1/10/18 On the Trail of Megalodon Ancestors: Scientists in Alabama Solve Forty-Year Shark Puzzle. 1/10/18 Cretalamna bryanti: New dinosaur-era shark, ancestor to fierce and ancient Megalodon, discovered in Alabama. 1/9/18 Fossil teeth link beast to Earth’s largest shark. 1/9/18 Nově identifikovaný druh žraloka je pravděpodobně předchůdcem megalodona – největšího žraloka, který kdy obýval naši planetu. Vědci učinili důležitý objev v evoluci těchto predátorů z fosilních nálezů objevených v americké Alabamě. 1/8/18 Bestia fósil recién descubierta relacionada con el tiburón más grande. 1/8/18 Alabama scientists have discovered a new shark named for ‘Bear’ Bryant family. 1/8/18 Shark species named after Alabama legend Bear Bryant. 1/8/18 Newfound Fossil Beast Related to Earth’s Largest Shark. 1/8/18 Paul ‘Bear’ Bryant now has an ancient shark species named after him. 1/8/18 Megalodon Ancestor: Newfound Fossil Beast Related to Earth’s Largest Shark. 7/19/17 Research paper identifies early Ice Age shark teeth in Alabama. 7/19/17 Shark! Ice Age Era teeth found in Alabama. 5/31/17 Paleontology’s next great find could be in Alabama. 12/30/16 Hidden in plain sight. 4/22/16 Paleo Profile: The Dawn Rough Tooth. 2/11/16 Dinosaur discovered in Alabama named. 1/31/16 Science Briefs: Dinosaur unearthed in Alabama points to duck-bills developing in ancient Appalachia. 1/29/16 Extraordinary fossil find sheds light on duck-billed dinosaurs. 1/27/16 New species of duck-billed dinosaur discovered. 1/26/16 Eotrachodon orientalis: New Duck-billed dinosaur species discovered. 1/26/16 New 83-million-year-old, rare dinosaur species identified. 1/26/16 Remains of previously undiscovered dinosaur species found in Alabama creek. 1/26/16 Eotrachodon: 83 million-year-old ‘ugly’ duck-billed dinosaur skeleton discovered in Alabama. 1/25/16 Researchers discover new dinosaur species in Appalachia. 1/25/16 Primitive hadrosaur fossil reveals “Duck-billed” dinosaurs originated in Eastern United States. 1/21/16 Research team identifies rare dinosaur from Appalachia. 1/21/16 Fossil of duck-billed dinosaur found along Alabama creek. 1/21/16 Nolesaurus: FSU biologist helps determine new species of dinosaur. 1/22/15 Did you know sloths once roamed Alabama? 1/7/15 Dinosaur expert coming for E-Learning Day. 9/4/14 The story of Sloss Quarters. 6/26/12 UAB students unearth clues to tell Birmingham’s blue-collar story. 6/26/12 Students dig for history in Birmingham’s Sloss Furnaces.